Huawei Consumer Business Group (BG) unveiled the HUAWEI Mate 20 Series, one of the most highly anticipated smartphone series of the year, recently at an event held in London. Representing a momentous milestone in the history of the HUAWEI Mate Series, the HUAWEI Mate 20 Series embodies the pinnacle of innovation. Designed with the industry’s most powerful and sophisticated process technology, the latest Huawei flagship devices set a new bar by which all 2018 smartphones will be measured. The HUAWEI Mate 20 Series is powered by Huawei’s densest and highest performing system on chip (SoC) to date—the Kirin 980. Manufactured with the advanced 7nm process incorporating the powerful Cortex-A76-based CPU and Mali-G76 GPU, the SoC offers improved performance and an unprecedented smooth user experience. The new 40W HUAWEI SuperCharge, 15W HUAWEI Wireless Quick Charge and large batteries work in tandem to provide users with the best battery life. The Matrix Camera System includes Leica Ultra Wide Angle Lens that lets users not only see wider, but also closer with its new macro distance capability. The HUAWEI Mate 20 Series is shipped with the highly customized Android P-based EMUI 9 operating system, on which consumers can enjoy all productivity and entertainment features easily and conveniently with a few simple taps and swipes. 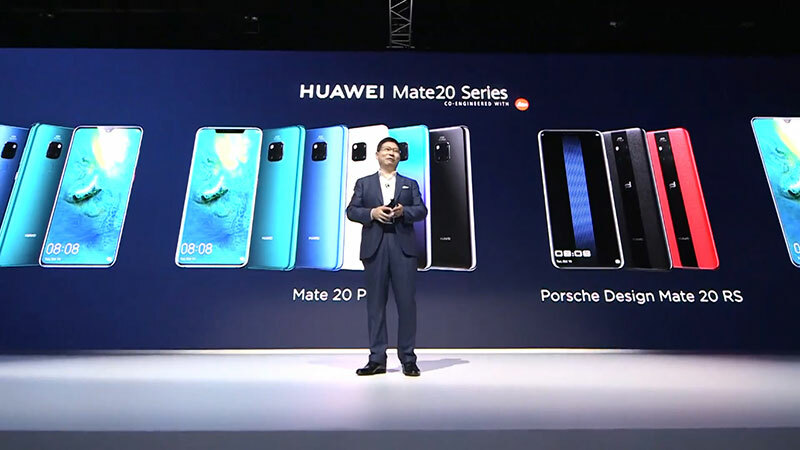 Available in 6.53-inch and 6.39-inch sizes, the HUAWEI Mate 20 Series encompasses four devices, including the HUAWEI Mate 20, HUAWEI Mate 20 Pro, and PORSCHE DESIGN HUAWEI Mate 20 RS. “Smartphones are an important entrance to the digital world. The HUAWEI Mate 20 Series is designed to be the best ‘mate’ of consumers, accompanying and empowering them to enjoy a richer, more fulfilled life with their higher intelligence, unparalleled battery lives and powerful camera performance,” said Richard Yu, CEO of Huawei Consumer BG. The SoC at the core of smartphones has a determining factor in a device’s performance and efficiency. Manufactured with the cutting-edge 7nm technology process, the latest chipset is equipped with a CPU that is 75 percent more powerful, GPU that is 46 percent more powerful and NPU that is 226 percent more powerful compared to the Kirin 970. Furthermore, the efficiency of the components has also been elevated: the CPU is 58 percent more efficient, GPU is 178 percent more efficient, and the NPU is 182 percent more efficient. The Kirin 980 is also the industry’s first SoC to be equipped with Dual-NPU, granting it higher On-Device AI processing capability to support any and all AI applications. HUAWEI Mate 20 Pro is the world’s first smartphone to support the 4.5G LTE Cat. 21 standard, allowing consumers to experience download speeds of up to 1.4Gbps. It also supports the world’s fastest Wi-Fi connection speeds–2GB footage requires only 10 seconds to download. The top-end flagship also supports dual-band (L1+L5) GPS positioning technology. The AI GPS Satellite Selection technology enhances the positioning accuracy across a wide range of scenarios. Building on the foundation of HUAWEI P20 Series’ camera system, Huawei augmented the HUAWEI Mate 20 with a powerful addition—16mm Leica Ultra Wide Angle Lens. This wider perspective creates a sense of spaciousness and a three dimensional effect to the images. The new camera system also supports macro distance, which produces crisp images of objects that are placed as close as 2.5cm from the lens. The added ultra-wide angle lens and macro support completes the feature set of the camera system, elevating it to a truly all-round camera that is ready to capture any and all action. The HUAWEI Mate 20 Pro is equipped with a 40MP main camera, a 20MP ultra wide-angle camera, and an 8MP telephoto camera. Together, the trio of lenses supports a wide range of focal lengths (equivalent to the performance of a 16-270mm zoom lens), enabling it to mimic the results from professional cameras. As an expression of the HUAWEI Mate Series DNA, all devices carry a FullView display with a high screen-to-body ratio. Compactly engineered, HUAWEI Mate 20 series can be comfortably used with a single hand. The HUAWEI Mate 20 (6GB + 128GB configuration), The HUAWEI Mate 20 Pro (6GB + 128GB configuration) and the PORSCHE DESIGN HUAWEI Mate 20 RS (8GB + 256GB configuration) will be entering Sri Lanka in the coming month paving the way for customers to experience the much awaited innovation.